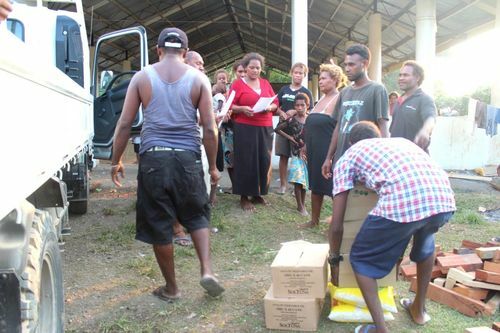 Distribution of relief supplies to one of the evacuation centres (ACOM). The information following is extracts from the report by the Anglican Church of Melanesia (ACOM) to update all their partners, including Anglican Missions, on the flash flood disaster in the Solomon Islands. This is a short report compiled by the Aid & Program Office on behalf of the Anglican Church of Melanesia (ACOM) Provincial Disaster Committee update on Emergency Relief Action and possible Recovery Plan for the 2014 Flash Flood Disaster which affected parts of Honiara city (areas closer to Matanikau River Bank) and Guadalcanal. With the series of meetings held and resolutions made, the committee had already coordinated relief support through its two (2) Diocesan Disaster Committees [Diocese of Guadalcanal (DOG) & Diocese of Central Melanesia (DOCM)] in respect to the National Disaster Action to the affected population. The ACOM Provincial Disaster Committee also continues to deliver relief support with the assistance of the respective Diocesan Disaster committees assessing the current situation of the various evacuation centres and condition of disaster stricken areas/communities. Thus, ACOM relief action did not in any circumstances subject to discriminate in terms of ethnicity and/or religion. The ACOM Committee also recommending Actions and Approach for Recovery and Rehabilitation for affected parts of communities and villages and to liaise closely with the National Disaster Committee and our mission donor partners for further deliberation in the areas of importance that ACOM may take future responsibility. The ACOM Disaster emergency relief support commenced on Saturday 12th April and still continuing with the second phase on relief supply effort. The distribution action was done on the various evacuation Centres on phases and were done on days apart from other stakeholders and the National Disaster relief support. Distribution of relief supplies also extended to all ACOM institutions located in Northwest and Northeast Guadalcanal affected by the flash flood as such the Selwyn College, Bishop Patteson Theological College Kohimarama and the four (4) religious orders households. Thus, goods for the relief supply were purchased directly to the suppliers and allocated through the two (2) Diocesan Disaster Committees for the coordination and distribution. DOCM Disaster Committee did quickly respond through their Diocese relief support before receiving assistance from the ACOM Provincial Disaster on the 12th of April and the distribution was done taking into consideration of the update situation and continuous assessment of the disaster affected population living in the current 27 evacuation centres. Both Diocesan Disaster Committees have started their relief effort distribution after further adjustment of their assessed data of the various affected communities in respect to the National Disaster report. The recovery and rehabilitation phase plan still awaiting declaration from the National Disaster office to confirm their action on winding down their relief effort and concentrate on the recovery and rehabilitation effort. It is now obvious that evacuation centres have dramatically reduced from 33 to 22 since the actual disaster event took place. Currently, the most populated evacuation centres were the Panatina Pavilion and FOPA village (these are people from the bench creek, lungga and Sun Valley areas).These huge population had been assessed separately and had been proven beyond means that they were not really affected compared to those living along the Matanikau river bank area. Most evacuation centres are schools that will certainly need the disaster victims to move out early as possible for the school to restart from its mid semester break. This is also another issue that needs to be dealt with professionally seeing that most evacuation centres will need to close down. It is clear from assessment reports and observation that most households from around Honiara city were not destroyed except for those that live along river banks of the Matanikau river (from Tuvaruhu to Koa Valley and Mamanawata areas) that were fatally destroyed and will certainly need full recovery and rehabilitation support from National Disaster and other donor agencies. The NDMO Director also declared in media that recovery and rehabilitation plan is still far from their discussion and they still continue emergency support and urging people to evacuate evacuation centres if their houses are still intact or not destroyed. Thus, the ACOM Provincial Disaster with the DOCM & DOG Disaster Committees assessment team will also make an effort to check on Anglicans at the evacuation centres who may have taken advantage of the situation and to solve their trauma and frustrations pastorally. The ACOM Provincial Disaster committee also agreed and already engaged the Trauma Healing and Counselling Team from the ACOM Justice, Reconciliation and Peace Commission to carry out counselling sessions in the respective evacuation centres. As of 19th April 2014, the Trauma healing and counseling team had visited all the evacuation centres and started off sessions early this week. As of today (24th April) update, most centres have been covered and have shown visibility and greater impact to rebuilding peace of mind and people reconciling with nature and God. Data also (yet to be verified) shown obvious presence of Anglican members in the respective evacuation centres and the DOCM Disaster committee will work closely with the National Disaster Committee to work on future aspects of the recovery plan. This is an update report of the relief distribution effort done and coordinated by the DOCM and DOG in support and coordination of the ACOM Provincial Disaster Committee. So far, the second phase of distribution arranged in a way that requests are obtained from the Dioceses responsible for the affected population and hence, more relief support is provided. The Director of National Disaster and Management Office (NDMO) stated in the media report that the NDMO representing the government is still concentrating on emergency response and property claims by the flood victims is still far from their current discussions. On behalf of the Church, we as members of the ACOM Provincial Disaster Committee would like to convey our sincere appreciation and acknowledgement to all our overseas mission partners and donors in the immediate positive response to our request for emergency relief effort towards the Honiara and Guadalcanal flash flood victims which affected almost 40,000 people. We, therefore, look forward for your continuous support in the recovery and rehabilitation effort to the most affected population and future emergency relief efforts. ACOM Clergy with Logistics Officer (RHS) and Diocesan Disaster Team Member looking (LHS).